Bangalore : Carrying forward its legacy of camera-centric smartphones in the Indian market, TECNO Mobile, the premium smartphone brand from TRANSSION Holdings, further strengthens its portfolio with two new forward-looking smartphones. Underpinning its USP of camera & full view display, the brand today announced the launch of CAMON iACE & iSKY 2 priced at INR 6,799 & 7,499 respectively. The sale of CAMON iACE starts from today and will be available PAN India through 35,000+ retail outlets. Whereas CAMON iSKY 2 will be available for sale from 20th August. 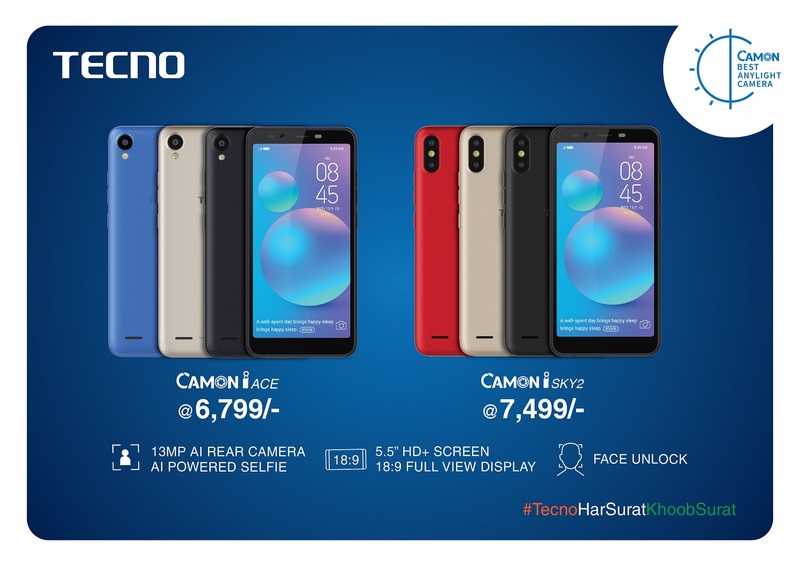 As the brand continues to witness a sharp rise in demand and remarkable acceptance for the CAMON series in India, TECNO is adding yet another dimension in the sub 8K smartphone category to fulfill its promise of making best smartphone camera technology accessible to all at best price in the segment. Both the devices, flaunt 13 MP AI rear camera, AI-powered selfie, 5.5” HD+ screen with 18:9 Full View display, 3050 mAh battery, and Face Unlock. With these two launches CAMON portfolio is now 7 SKU strong with smartphones available across price-points between 6-14K. All TECNO products come with 3-in-1 multi card slot where you can put Dual Nano SIM along with a SD card and a“111” brand promise of TECNO. Any consumer who buys TECNO smartphones gets an advantage of 1-time screen replacement in one year, 100 days’ free replacement, and 1-month extended warranty.